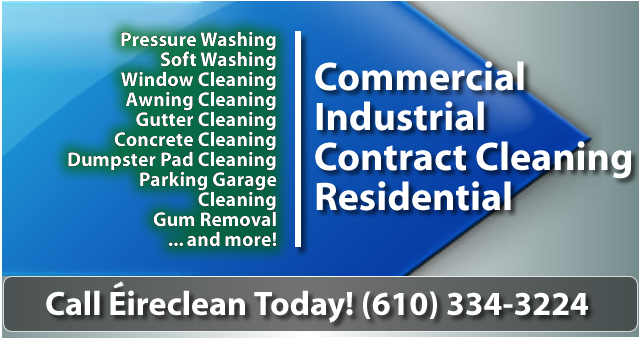 WELCOME TO ÉIRECLEAN, the Mid-Atlantic region’s premier power washing and window cleaning company. We have been providing window cleaning and power washing for retail chain stores and other businesses since 2001. We power wash concrete surfaces and a variety of building facades, for example: EIFS, Dryvit, stucco, Hardiplank and brick. Does your building exterior, sidewalk, or parking garage need cleaning? Perhaps your windows or awnings need attention. Our professional cleaning services in the Mid-Atlantic region are the answer. Please contact us today! 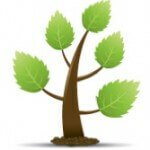 ÉIRECLEAN is dedicated to using green, environmentally safe, biodegradable products for all our cleaning work. Our region of professional power washing and window cleaning work includes all of Eastern PA, Western New Jersey, Delaware, Maryland, Washington D.C., and Northern Virginia. 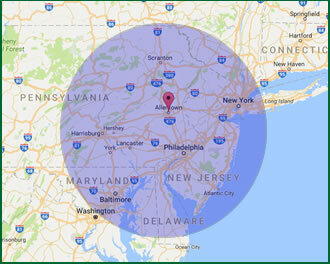 We service our large chain stores to further locations. If your organization, company or property needs commercial exterior cleaning services, then call us today! Eireclean provides professional exterior cleaning services to commercial and residential clientele, including power washing, window cleaning and roof cleaning. We are proud to have served the Lehigh Valley area and neighboring states for the past 15 years! Eireclean was established in 2001. Since then, we have worked hard to build a reputation for safety and accountability. We provide service to HOAs, offices, government buildings, banks, restaurants, and schools. Contact Eireclean to remove stains and dirt from all your business or home’s exterior surfaces. We are fully insured and have a perfect safety record, so why wait?